Americans are taking massive amounts of painkillers. Let me give you some interesting facts I have found. Painkillers include not only opioid narcotics, such as oxycodone, but also other common, prescribed or even over-the-counter, non-opiod pain medications. Opiod use is often defined by morphine milligram equivalents or MME. In 1999 the MME per person was 180 and in 2015 it rose 3-fold to 640! 640 MME per person equals 5 mg of hydrocodone every 4 hours. In 2015, the amount of opiates prescribed was enough for every American to be medicated around the clock for 3 weeks. Even at low doses, taking an opioid for more than 3 months increases the risk of addiction by 15 times. A dose of 50 MME or more per day doubles the risk of opioid overdose death, compared to 20 MME or less per day. And, at 90 MME or more, the risk increases to 10 times. The vast majority of people who died from opioids had visited their doctor and received a prescription for oxycodone within a month of their death. Because of an increase in prescription narcotic overdoses, drug deaths now outnumber traffic fatalities in the United States. From 1999 to 2017, almost 218,000 people died in the United States from overdoses related to prescription opioids. Drugs were a cause of death in 2009 of at least 37000 people, according to the U.S. CDC. 8 years later, more than 72,000 Americans died from drug overdoses. This opiod crisis is bad enough, but most people are not even aware that other commonly used prescription and nonprescription non-opioid pain medications are also potentially dangerous. One of the most commonly used medication groups is nonsteroidal anti-inflammatories (NSAIDs), like aspirin and ibuprofen. NSAIDs have been found to cause about 16,000 deaths per year, due to gastric bleeding. In addition, NSAIDs damage the kidneys and liver, adding to the disease burden and death toll from them significantly. It has been estimated that a woman using ibuprofen only during every period of her life for PMS increases the risk of kidney failure by 400% after menopause. The chronic use of NSAIDs, also reduces the body’s capacity long term to heal itself from injury or tissue damage. Besides the risks from NSAIDs, Tylenol or acetaminophen, damage the liver. Thousands of people a year end up with liver failure due to unwitting acetaminophen overuse. Acetaminophen is often hidden in over-the-counter medications, like cold and flu formulas. People are innocently overdosing with it. So, we have a massive pain management problem in the US. It has been estimated that there are over 100 million people in the US, across all age groups, races and genders with chronic pain. Not only are there significant risks from opioids and other non-opioid medications, there are significant risks from the procedures used to help with pain, often resulting in even worse pain situations. Sometimes these procedures are absolutely necessary and appropriate. Unfortunately, alternative therapies are often not tried 1st or at all. PEMFs are an important pain management option. PEMFs should be considered 1st before opiates are used, especially if they may be needed beyond a week or 2. The same can be said for NSAIDs. Use beyond a week or 2 increases the risk of gastric bleeding. Kidney damage risk increases with regular use over months. You wouldn’t normally consider getting a PEMF system only for a short-term pain problem. But, if your pain problem is chronic, lasting beyond a month or more, is very likely to last beyond a month or more, or due to a cause that is not going away, such as arthritis, PEMFs can be an ideal solution. They are safe, non-toxic and noninvasive and can be applied in the home setting at your own convenience. In addition, they can be used for many other health conditions not only for you but also for other household or family members, including pets. 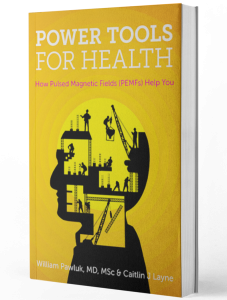 More information can be found about PEMFs for different conditions in the blog section on DrPawluk.com https://www.drpawluk.com/category/blog/, my book Power Tools for Health https://www.drpawluk.com/product/power-tools-health/.